WHERE & WHEN: “The Hangover Part III” Los Angeles Premiere on May 20, 2013. MY VERDICT: Heather was quite the goddess in jade green when she arrived for “‘The Hangover Part III” in a form-fitting Herve L. Leroux silk dress with a daring pleated plunge neckline that layered beneath the bust. It wasn’t aging nor was it ‘too young’, and the color is stunning; it did well to compliment both Heather’s fair complexion and light blonde hair. With dresses that feature such dangerous dip in the neckline, it can border on way too much cleavage exposure, but I think Heather worked this just fine. Speaking of her hair, Heather hair her golden tresses style in cascading loose curls that were gathered to one side. She kept her makeup light with a matte pink pout, but her jewelry was very bold. Heather wore stacked chunky diamond bangles and a gorgeous emerald and diamond statement necklace from Amrapali; she additionally accessorized with a matching pewter box clutch and sandals. WHERE & WHEN: “Cleopatra” 66th Annual Cannes Film Festival Premiere on May 21, 2013. MY VERDICT: Jessica was the epitome of refined elegance when she made her way down the red carpet for the Cannes Film Festival premiere of “Cleopatra” today to celebrate the 50th anniversary of the film, which starred the late Elizabeth Taylor and Richard Burton, wearing a long sleeve ivory silk Versace Collection gown with a floor-length cape. Although the front of the dress was modest–and slightly ill-fitting, the exquisite attachment sat below a stunning deep v-cutout at the upper back. The amount of accessories were minimal, but what Jessica wore packed a lot of power. | continue reading..
WHERE & WHEN: “Blood Ties” 66th Annual Cannes Film Festival Premiere on May 20, 2013. WEARING: Christian Dior dress and shoes, Chopard jewelry. MY VERDICT: Naturally Marion Cotillard was the first to debut a new design from the recently shown Christian Dior Resort 2014 collection. 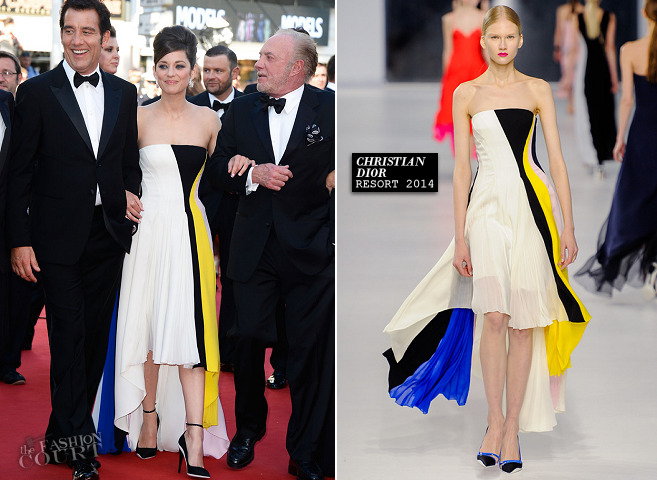 The beautiful French actress arrived on the red carpet for the Cannes Film Festival premiere of her movie “Blood Ties” in a breezy white silk bustier dress with striking multicolored panels throughout in black, old yellow, electric cobalt, and pale pink. The breezy design looked effortlessly elegant on Marion–especially due to her glamorous high up-do that had her bangs neatly pinned to the side. This hairstyle allowed for Marion’s exquisite Chopard mine gold and diamond open hoop earrings to be clearly seen. | continue reading..